Have you ever been asked what period in time you would want to live in if you could time-travel? Ever answered with the Victorian period? If yes, then great you’ll like this blog. If not, then still read on because my blog is also about my placement at Manuscripts and Special Collections as a Cataloguing Assistant, an opportunity that I thoroughly enjoyed and would definitely do again. 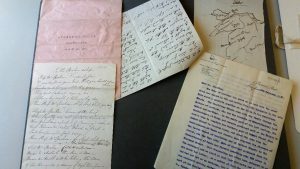 My task as a Cataloguing Assistant was to look at the letters of Lady Charlotte Denison, daughter of the 4th Duke of Portland and a very respectable member of the Victorian aristocracy, summarising her letters so that individuals interested in her life could then look to the summaries instead of having to read through all of her letters to find the areas that they are interested in. These summaries will appear on the Manuscripts and Special Collections online catalogue, an achievement that I am really proud of. Whilst it was difficult at first to understand the handwriting especially because their shorthand and abbreviations are rather different to the ones we use today; I really enjoyed being able to analyse the letters, explore the archives and actually interact with the primary sources, being able to touch items that are not usually accessible including various letters containing the House of Commons insignia and a copy of a letter from Queen Victoria. Throughout this placement I have not only acquired a wide variety of skills that will be transferable when looking for future employment but I have also had a taste of what it is like to work in the archives and within the heritage sector, an area that I would really like to continue working in. 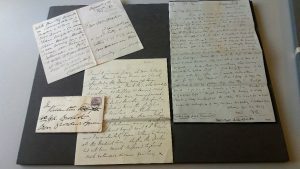 But the most important part of my placement was the way that I was able to interact with the past, and I want to conclude my blog by talking about Lady Charlotte Denison and how her letters provide us with the opportunity to explore Victorian Nottingham and rather surprisingly what she mentions within her letters are not too dissimilar to modern day conversations. She is concerned with politics (partly because her husband was a Member of Parliament), writing about the Corn Laws, a topic that any history student who studied Victorian politics will be well aware of as well as death, love and inheritance, issues, topics that are still relevant today. It is perhaps the relevance of her conversations that are the most surprising aspect of her letters because it truly shows how history repeats itself. I think this is the most valuable lesson that I learnt from my placement and I strongly encourage those who want to work in the heritage sector or equally those who are interested in social history to consider a placement with Manuscripts and Special Collections. It is an invaluable experience you will not forget! This is a guest post by Shannon Layzell, Second Year English and History Student at the University of Nottingham. For more information about Manuscripts & Special Collections, including how to visit, please see our website. The Papers of Lady Charlotte Denison will soon be available to search in the online catalogue (as Pw N 1-32) and can be viewed by appointment in the Reading Room.